The perfect body and skin moisturizer for the entire family. Use to diminish wrinkles and heal your skin back to its best. Contains Vitamins and Minerals to help soften and protect your skin from free radicals and sun damage. Use as a natural sunscreen. Use on the entire body and skin. 100 % Natural Skin Moisturizer with vitamins and minerals. Perfect for any skin condition and its chemical free imported from Africa. I love love love this stuff. I have very dry skin and would be ashy 1-2 hours after apply lotion. That was on the west coast; but now that I live on the east coast and experience harsh winters, it's even worse. Baby oil and Vaseline are super greasy and don't last all day either. With Shea butter, I apply a small amount right out the shower and I'm good to go; no more constantly reapplying (with the exception of my hands b/c I wash them frequently). I didn't find it to be too hard; I just soften in the palm of my hands then it easily applies to my body. Love this Shea butter, I have actually thrown away all of my moisturizers "DON'T NEED THEM ANY MORE". Let me start by saying I love the nutty fragrance that's how u can tell if it's real unrefined shea butter. I use it for everything; blend with my essential oils (Mudfarm), use with other oils to make a facial moisturizer, (coconut, almond oil, rosehip seed oil and jojoba oil), body butters, lips and hair. I whip it up and it goes on like silk a little goes a long way. Since I received this product I have been on every web page I can find looking for new ways to make diy beauty products using Shea butter. "GET THIS BUTTER", it's a wonderful moisturizer, plumes up the skin, gives your skin a remarkable grow, blends well with essential and carrier oils, and u can customize and create your own skin care products very cheap. Will only buy unrefined shea to make my beauty products, will buy again. I am on Accutane, which causes severe dry skin, but it basically helps get rid of acne. My skin is super sensitive and irritated and regular face creams were burning my skin and other face oils were too pore-clogging for me. I also get occasional eczema on my arms. I decided to try shea butter - first of all, because I wanted to include more natural things in my skincare routine, and second of all, because unrefined shea butter is a "0" on the comedogenic scale, meaning there is a very little chance of it clogging your pores. I used this stuff all over and I noticed a difference in my skin after one night. I woke up and my skin looked more hydrated, my fine lines smoothes out, and many of my flakes were gone. The BEST part was it DID NOT BREAK ME OUT. It is reallllly thick, but it melts with the heat of my skin. I am so happy I purchased this and I will keep buying this until the day I die. THIS Brand of Shea Butte is the BEST. I will be a lifetime customer. This stuff is HEAVEN. I use it on my skin and hair, and the improvement in both is astounding. I don't have to wear makeup anymore because my skin looks so good. I like the nutty smell. It's worth it!! Use it daily on your entire skin and hair and see the results. Working so good for me and my family now. This is some of the best shea butter i have every purchased. Its smooth and very high quality. It goes on my skin so well and i love the results. My eczema and dry skin has dissappeared and i love the product. I highly recommend shea butter for anyone looking for solutions to dry skin and other stuff. Its working great on my face and hands this winter as well and i am now getting into using the black soap. So will keep a review for that soon. Simply wonderful Shea Butter from this brand. As I have become more interested in organic and raw products, raw Shea Butter has been on my “to try” list. I finally got the opportunity to try Raw Shea Butter by Better Shea Butter. It has been fun making different lotions and lotion bars from it, although you can use it straight out of the package by taking a very small amount of the Shea butter and rubbing into your skin. The consistency is very much like that of cookie dough, (and it almost smells like cookie dough!). The sniff test is very mild and pleasant. I chose to make a whipped lotion, a liquid lotion, and lotion bars with this lovely Shea butter and have been very pleased with the results. Between the available e-book recipes and Internet recipes, there are lots of ideas as to what you can do with your Shea butter if you want to use it beyond little dabs straight from the package! I love my new lotions! I selected this shea butter specifically because of what the philosophy of the company is and what they do in Ghana. I am very particular about which companies I support when buying this kind of product since their harvesting and production can be riddled with human rights infringements. I chose to support FairTaleGhana because of what their philosophy of a company is and how they support and uplift women in the communities they work with. It's just a bonus that the product itself is of high quality. Great job - keep doing what you’re doing! When I received my order, there was a hand-written note from someone in the company. Even though this was a small gesture, it really makes you feel appreciated as a customer. I’ll definitely support you in the future! I love this product! Very pleasantly surprised by the quality and quantity that come in the package! Will definitely buy again...but probably not for a while because I have a lot of butta to go through! I LOVE the fact that it is from Ghana and it helps the women be self supporting, the benefit for me is that is is GREAT for my skin and natural hair! It has cleaned up my skin complexion! Now I buy it all the time now. I've purchased African shea butter from multiple vendors but the FairTale brand is on another level. This is true raw shea butter. I have eczema and this smooths my skin and heals is as well. Thank you for the marvelous product! great product. I can see huge difference , my skin is not dry anymore !! I got this product week ago and I see huge difference on my skin . It feels softer and absorbs really well . I leather it first with my hands and than apply . Next time I will get whipped version to try it as well. I got black soap as gift which I appreciate so much . I gave it to my 22 year old daughter to try since she is struggling with acne .thanks so much !! Works wonders on my dry chapped skin and hands. Very happy with this product! I love this Shea Butter! Here is my story :) I first found this brand Mudfarm and maker of Shea Butter at a festive quite a few years ago. I purchased the largest size available at the festive vendors. There were many different sellers with all natural products made by their country which was wonderful and I am so glad I picked this Shea Butter up that day. I love anything that is all natural so when I almost ran out I sort of panicked. I got my almost empty container and looked at for the company who made it and found this to be produced by the same maker as the one I found and loved using. This has been an excellent and truly super beneficial moisturizer for me. This Shea Butter itself is literally amazing, it has a faint almost non-existent scent that doesn't overpower my perfume which is very important to me. Love this stuff so much. This is nature's miracle cure for dry skin. Anyone who suffers from eczema or psoriasis should be using this as an everyday moisturizer. This particular brand of shea butter is unrefined so you will get the full therapeutic benefits when applied to your skin. And its from a fair-trade organization so you don't have to worry about unfair labor practices levied on the wonderful women in Africa who harvest the shea nuts to create this divine butter. 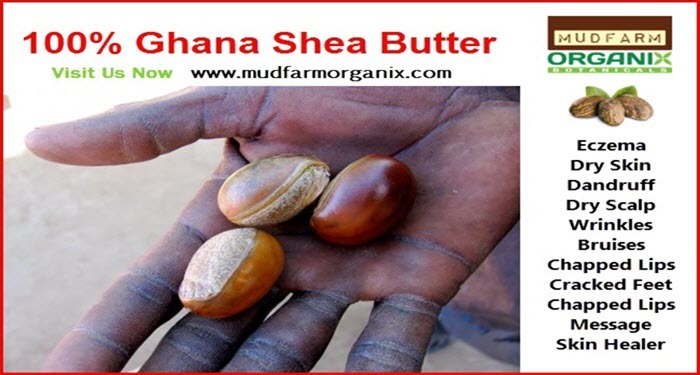 I have been using Mudfarm Shea Butter for the past year, and it has totally changed my skin on my hands and feet. It works amazingly every day for me. As women age, it isn't uncommon to have dry skin, especially if you spend a lot of time outdoors. I couldn't seem to find a lotion that would adequately stay on my feet, especially at night time, and one that would also hydrate my hands without making them greasy. Mudfarm seems to do a great job with both. I keep a tub in the shower so that it warms up in the moist heat, and when I am finished showering or bathing, I apply the shea butter on my legs, feet, and hands and it goes right into my skin. I really love this product and the fact that it has chemicals is the best part of it all. So I have been natural for almost a year now and even when I was relaxed I struggled with really dry hair. Dry hair leads to breakage and a lot of other problems so it was something I was desperate to find a solution to. For the longest I thought oils would solve my problem (and trust me I tried a handful of oils) and while they did make my hair oily they weren't moisturizing my hair. The problem is not oil however, the problem is that oil wasn't what my hair needed. Only this past week did I actually learn that because of my thick hair type, in order to moisturize my hair I would need a thick moisturizer and normally oil alone would not work unless I had more of a finer hair type. And trust me this product is thick, but more importantly it is SO MOISTURIZING. My hair has literally never felt so soft or moisturized and I seriously have to give this a 5/5 especially for those of you who have thick hair. Sorry this was so long, I'm just genuinely surprised by the fact that I've finally found something that works with my hair type. Yes it's great, this moisturizer is thick.. but a little goes a long way! And although thick it absorbs completely into my skin, leaving it fresh and moisturized. I am a licensed esthetician so I have used a plethora of skin products for years now, and since trying Mudfarm I believe this product stands up to some of the $80 skin moisturizers that are currently on the market. Love this! Enjoying Shea Butter from Ghana very much as I use it generously on my hands and elbows before bed.. and love how soft and moisturized my skin feels in the morning. I wish it comes in the smaller size so I can stash them around my purse, bag, car, jacket... etc. My family and I use this Shea Butter religiously. Here is some useful information on Shea Butter. Very pure and great shea butter and it's fresh as i can tell and have purchased many brands before. Usually buys from newdirections but this quality is way better by far and my customers appreciate the raw unrefined quality and scent from mudfarm shea butter and black soap. I usually go to the warehouse to pick up and purchase my products so i figured to write a great review for my great products. This is my go to sealant for moisture when doing the L.O.C method. It can be used for moisturizing your body as well, I also use it on my face at night. I bought it from my local beauty supply store and it is very inexpensive. I recommend this to all mu friends struggling with dry hair and skin. I love this produts it is a great product for your hair and skin.l use on my hair and body.You can't go with this shea butter and it is a top must have hair product if you are natural.This produt is so gently you can even use it on a baby.I would definately reccomend this produts. Love Shea Butter from Mudfarm! I deal with extremely dry skin in the winter, mostly around my nostrils and uni brow area on face and I must say after applying just a little African shea butter my dryness is completely gone, don't require you to reapply frequently throughout the day, once a day and your dryness will be away! It's Saturday night...and I am all alone. I look on my bathroom counter and see this unassuming bag of unrefined shea butter. I close my eyes in a desperate attempt to decide what to do. Should I spend 2 hours decorating myself with the traditional weekend war paint and performing the flat iron frenzy to then join my girlfriends for an evening of tomfoolery? Subject myself to the advances of aged frat boys whose pores ooze the fragrance of stale tailgates and red meat? Wiggle and jiggle my way across the dance floor in an archaic attempt to attract an alpha male that can match my rhythmic intentions? NO! I choose me. And a French Rose. And mac and cheese (don't judge). And Unrefined Shea Butter by Mudfarm Organix Botanicals. What better to do on a lonely Saturday night than whip up an indulgent batch of homemade body butter? As I watch the shea butter melt into the coconut oil, my spirits lift and senses awaken. With a touch of lavender essential oil, my inner goddess squeasl with the delight! The whirring of mixer blends into the smooth jazz coming my iPhone in a perfect symphony. When it's done, it looks good enough to eat! But no...that's what the mac and cheese is for. I look at the clock...8pm. Is it too early to get ready for bed? No...it's not. Grinning from ear to ear I take my newly blended concoction to the bathroom. Best investment for skin care i ever made.. I used it on my 4 year old, who has light eczema. Small white patches that appeared once the weather turned cool, disappeared. Amazingly, I applied only once a day on two alternate days. (Someone with experience with eczema or other skin issues know that we need to apply creams twice a day consistently, everyday). Even with that, the patches disappeared completely, which in itself is amazing as it takes atleast 4 days to see healing using aquaphor or other store bought creams, even with Cortisone ! Here is a great recipe for DIY lotion. Put in freezer or set aside until partially solidified. Great Shea Butter, much better than the grade a but thicker so you need to work it in a bit more but the smell is so amazing..
First time buying from Mudfarm which was referred by a friend from work. Shea butter is super rich and thick and I feel luxurious smearing it on. I largely use it on my body and especially in the winter. Shea butter is best for me to RETAIN moisture; I DO NOT use it to REPLENISH moisture, but rather lock it in. The brand I've found that I like best so far is Mudfarm Organix. The butter is thick and creamy, smells raw and nutrient rich, is a slightly darker color, and rubs in well, as opposed to some other brands I've tried which are too hard and take a while to rub out between my hands. This shea butter is pretty good. I was expecting a bit creamer texture that soaks in a bit better. I find this shea butter to be a bit sticky compared to other brands. However, it has a nice smell and is a good product given the price and extremely fast delivery time. This is the best Shea Butter i have ever used. Its creamy and has a nutty flavor and i use it everyday.. Your Shea Butte is really rich Mudfarm. I will purchase again soon, this will last for a bit. Click the button below to add the Shea Butter - 100% Raw Unrefined Organic to your wish list.